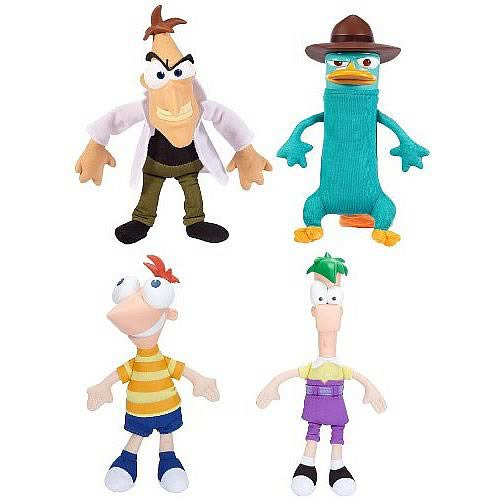 Shopping for Phineas and Ferb Plush? What will Phineas and Ferb get up to this time? Based on the #1 animated series on the Disney Channel! All your favorite, wacky characters! Phineas and Ferb follows two suburban stepbrothers on summer vacation. Each day the pair devise ambitious, involved plans and inventions to stave off boredom, often bringing them into conflict with their sister, Candace. The series' subplots almost always features the boys' pet platypus - Perry - acting as a secret agent to fight an evil scientist named Heinz Doofenshmirtz. Now you can bring the excitement and fun into your home with these zany Gabble Heads plush, featuring some of your favorite characters! Stand about 7-inches tall.